These are transverse bands that separate the adjacent ends in cardiac muscle fibers. Normally these structures appear as stained irregular lines at 90 degrees to the striped sarcomeric pattern. These are generally pronounced as “in-ter-ca-lat-ed disks. As mentioned earlier, these discs connect the individual heart cells called cardiomyocytes to form the atrial syncytium. In fact, both intercalated discs and pacemaker cells are characteristic of cardiac muscle tissues. Similarly, these transverse bands and striations are characteristic of cardiac muscle. Fascia adherens: These are majorly the anchoring regions for actin. Once attached, the thin filaments of actin bind to the sarcomeres of the cardiac muscles. Macula adherens: In order to prevent separation during contraction, this junctional complex directly attaches to the intermediate filaments and cause the cells to adhere tightly to a group. These specialized cell structures are also known as desmosomes. Gap junctions: These are large and small specialized intercellular connections that facilitate direct contact between the cardiac cells. These intercellular channels are important as they allow action potentials to spread across the heart. In this way, the gap junctions serve to transfer electrical excitation between the cardiac cells. The rapid exchange of the ions enables the cardiac muscle to function and contract as a coordinated unit called syncytium. Key research studies have, however, revealed that mixed type adherens junctions, called singular area composite, constitute most part of the transverse bands. Simply put, the intercalated discs histologically represent both desmosomal and fascia adherens proteins. 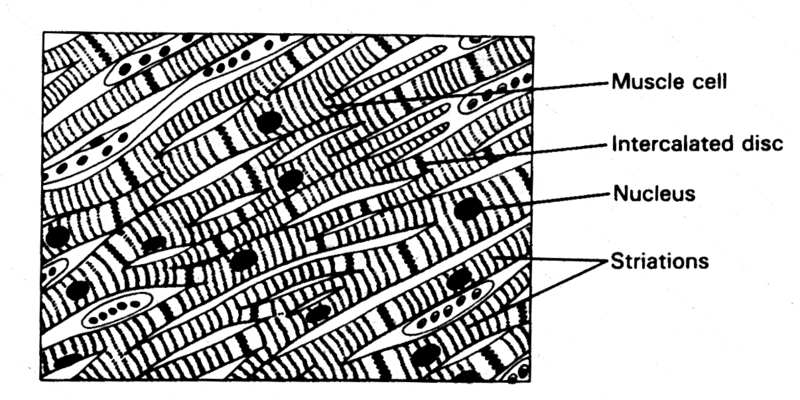 The intercellular junctions transect the myofibrils and replace the Z line at irregular intervals along the branches of muscle fibers. This is most evident at the axial level. The cardiac muscle is normally found only in the heart. Here, the myocardial cells usually appear short, branched, and closely interconnected to form a continuous fabric. The cross-bands, however, get heavily stained between the adjacent cells during a histological examination of the cardiac tissue. These discs usually have a step-like arrangement, where transverse components, consisting of desmosomes, run perpendicular to the long axis of the cell. On the other hand, the longitudinal components run parallel to the cardiac cells. In the presence of a chief protein component called connexin, the myocardial cells electrically and mechanically couple these intersecting discs. The primary role of the cross-bands is to hold the adjacent cells together by providing sites of strong adhesion. The gap junctions promote diffusion of ions between cells and allow waves of depolarization to spread over the entire heart by passing from cell to cell. Electron microscopic (EM) studies have shown that severe septic injury may cause these transverse bands to lose their structural integrity. Many cardiac disorders may result in malfunctioned discs. The heart’s contractile tissues are composed of individual cells that constitute contact sites (intercalated discs) that control the mechanical as well as electrochemical coupling while the heart beats. These discs are known for their active involvement in cardiac disease. They are assembled together in the process of the heart development and get affected hugely by cardiomyopathy. During the dilated cardiomyopathy, there are changes that are observed at the molecular level that affect the heart functioning, thereby leading to cardiac diseases. It is an acquired progressive disease that is age-driven while showing its clinical manifestations mostly during the young adulthood. The symptom includes major ventricular tachyarrhythmias. It is characterized by sudden death or through pathological examination including the degeneration of ventricular cardiomyocytes being replaced by fibro-fatty tissue. Earlier, the disease was supposed to be involving only the right ventricle while recently, it has been observed that there are frequent chances of the left ventricle of being involved in generating this condition. What is the scientific name of intercalated disc? Medical experts usually refer to it as “cardiac intercalated disc”. 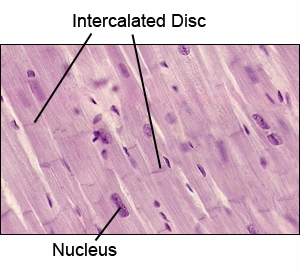 Intercalated discs are found in what type of muscle? As aforesaid, these are found between cardiac muscle fibers in the heart. Are intercalated discs and striations found in skeletal muscle? Although striations are found in both skeletal and cardiac muscles, the former is devoid of intercalated discs. Do smooth muscles contain intercalated discs? Smooth muscles are not a part of the heart as it is composed of only cardiac tissues. What is the relation between intercalated discs and myocardium? 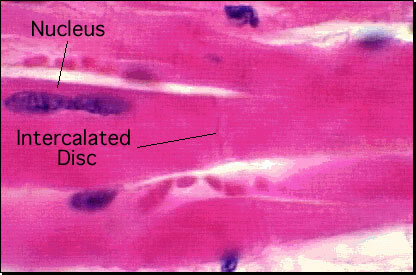 Since myocardium represents the muscular tissue of the heart, intercalated discs are present in this layer. Are the intercalated discs rich in mitochondria? The nucleus of the cardiac muscle cells comprises of mitochondria, Golgi apparatus, lipofuscin, and glycogen. However, the junctions between these cells do not have such elements and only act as attachment sites.